With the start of WWII, it became painfully obvious that the UK was not going to be able to provide the manpower it needed on its own to defeat the Germans. This was exacerbated by the debacles in France. So the call went out to the Commonwealth to provide the people needed. This was particularly the case when it came to pilots. It was felt that providing entire squadrons with most if not all the manpower provided by a particular country would be a benefit and that was done with various levels of success. 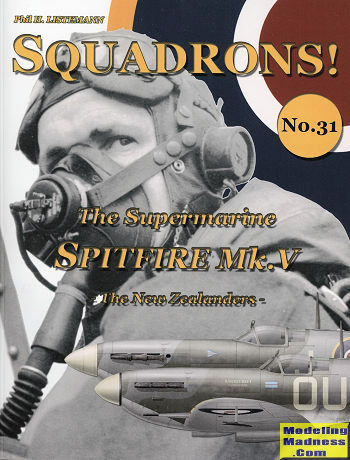 New Zealand was one nation that eventually provided the manpower for six squadrons, 485-490, with two of them being fighter squadrons. The one on which this book concentrates is 485 squadron as 486 never flew the Spitfire, starting instead on Hurricanes and eventually flying Typhoons and Tempests. 485 actually flew the Spitfire V for nearly two years, a fairly long time to be with a single airframe. It was also fairly successful in its job, but in the end it was time for a new airframe and the unit converted to the Spitfire IX in mid 1944. This book follows the usual format with a brief history of the type then the more extensive history of the unit itself. There's the usual information on victory and tables of losses as well as some great period photos and more than the usual number of superb full color profiles of aircraft used by this squadron. Thanks to all the well done research and choice of illustrations, it makes for a superb addition to the series and its reasonable price is one that should appeal to many. Review book courtesy of www.raf-in-combat.com. Visit them for other great titles. You can get this one at this link.